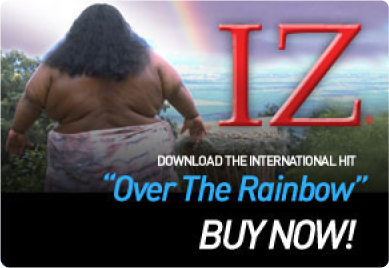 Israel “IZ” Kamakawiwo’ole breaks yet another record in Europe by beating our artist’s like Lady Gaga, Katy Perry and Shakira in Germany’s All Time Download Single Charts with 512,688 downloads! This afternoon we had a visit from Israel’s wife Marlene and in her hand was a small ʻukulele case with scribbles and stickers all over it. No it wasn’t THE ‘ukulele from IZ’s performances.